It is 1939. Germany and Russia occupy Poland. Polish airmen who have escaped capture head for France. In June 1940 France falls. Polish airmen once again escape this time to Great Britain. Nazi propaganda chief Goebbels derides them as Sikorski's tourists. They join the RAF and 303 squadron is formed. The Poles call it the Kosciuszko Squadron. Great Britain fights to survive as in the summer of 1940 the Battle of Britain begins. By the autumn the Luftwaffe admits defeat in its effort to destroy the RAF. Polish fighter pilots and ground crew play a vital role in the battle. Their efforts help save Great Britain as Hitler cancels his invasion. Publisher - Published by Arrow Books in the UK in 2004. This book was first published in the USA under the title A Question of Honor: The Kosciuszko Squadron - Forgotten Heroes of World War II. The authors of the book have a website which describes the book, gives author details and provides additional photographs. The book rather loosely follows the careers of a handful of fighters of this Kosciuszko Squadron as they make their way West from a defeated Poland, through a defeatist and stunningly unhelpful France, to Britain. Initially treated with contempt, the Polish flyers quickly proved themselves remarkable and made a most significant contribution to the Battle of Britain. During that Battle, in fact, they were seen as indispensable...At the book’s end, we find the Poles treated as a nuisance once again. This powerful ally was excluded both from the founding of the United Nations and the victory parade in London... For those from Eastern Poland-an especially large contingent of the fliers-the betrayal was doubly painful as the Soviet Union simply incorporated the eastern half of prewar Poland. 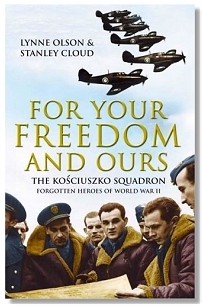 The authors had access to the squadron's unofficial diary and to letters, interviews, memoirs, histories and photographs. The personal experiences of these "hell raisers" illuminate the momentous events of the war...The drama and excitement of the battle [of Britain] make for heady reading. The Kosciuszko Squadron's diary entries, with personal comments by the pilots, give the reader a sense of immediacy. Squadron 303 was credited with downing more German aircraft than any other squadron attached to the RAF...The second part of the book, aptly titled Betrayal shifts its focus to the fate of Poles and Poland later in the war as Western Allies tried to appease Stalin's Soviet Union at Poland's expense...The book is a tribute to Poland and an eloquent indictment of its Allies. This page was added on 01 September 2008.